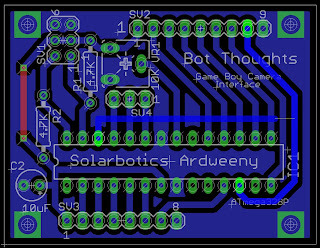 I draft all my circuits and board designs using Eagle from CadSoft. 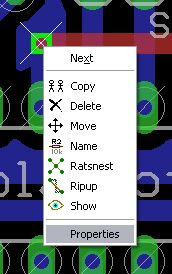 Having drawn a couple dozen of circuits and PCB layouts using this software. I picked up some tricks along the way. For the home DIYer, single-sided PCB fabrication is well within reach. Double-sided, not so much. I find it easiest to hand route most of my designs to ensure the traces are exactly where I want them. Occasionally, there is just no easy way to route every trace on the bottom. Using jumper wires on the top side of the board is a simple way to complete the single-sided design. 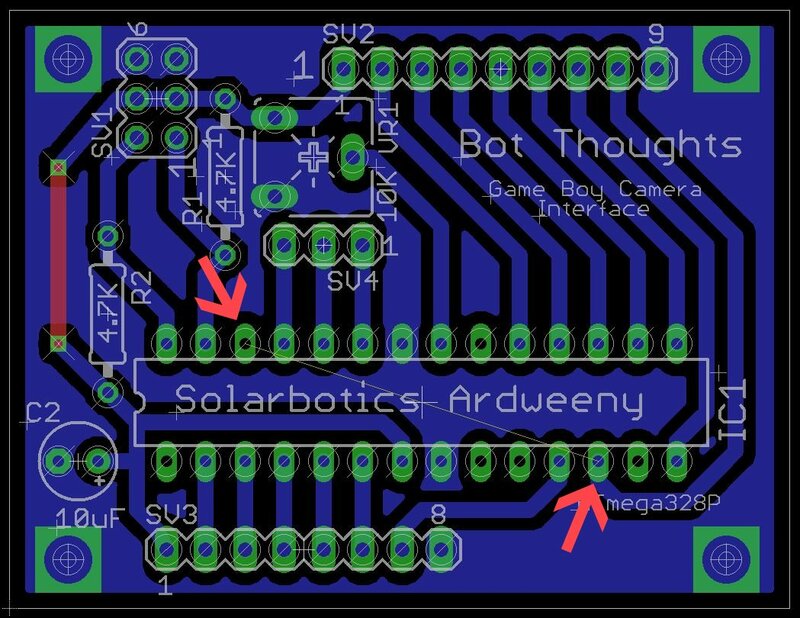 In upgrading Pokey my firefighting robot, I created a board to interface a Solarbotics Ardweeny (ATMega328P with a backpack board) to a GameBoy camera to detect flames. I'd laid out the entire board but pin 12 and pin 26 on the ATMega328P still needed to be connected (see pink arrows below). There was no convenient way to do this on the bottom layer. 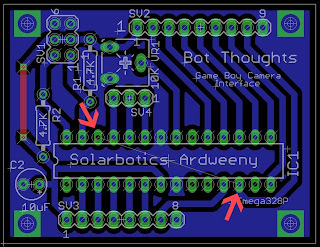 Notice pin 12 has a trace going up to pin 8 of the top pin header, which is the camera interface. Please ignore the vertical red trace on the left of the board. Its purpose will be discussed in another article. The first step is to go ahead and draw a trace between pin 26 and the trace between pin 12 and the top pin header. See below. We're going to convert part of this new trace to a top layer jumper. Draw the trace so that there's a horizontal section separate from the rest of the trace. Draw trace. Ensure there's a horizontal section. Notice this new trace features a vertical section coming off pin 26, then a right angle and a long horizontal part. That horizontal section of the trace will become the jumper. If we didn't have the vertical part of the trace, the jumper would land on top of pin 26 and that just won't work. 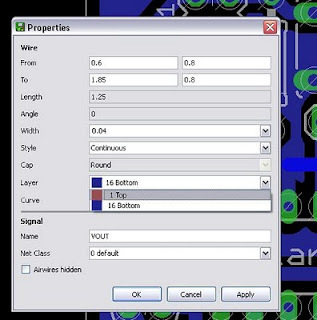 Once you've drawn the trace and connected the pins, right click the horizontal section of the trace, and select Properties from the contextual menu. Select the Top layer from the Layer pull down menu and click Ok. Select Top from the Layer menu to move the trace. The trace is now converted to the top layer and is colored red. Vias are added automatically. 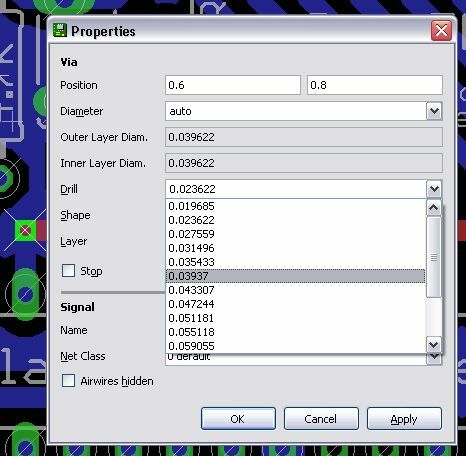 When you print your PCB design artwork for transfer, simply turn off visibility of the top layer. The resulting printout will include the vias for this trace, but not the top layer trace itself. Implement the top layer traces as jumper wires. 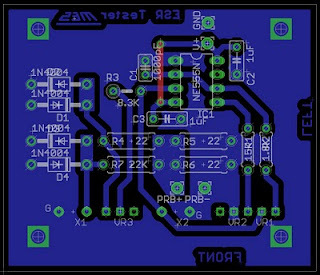 After etching your board, you can simply run a bus wire or hookup wire as a jumper between the two vias. This approach of using bus wire jumpers was common in a lot of 90's audio gear I've disassembled. 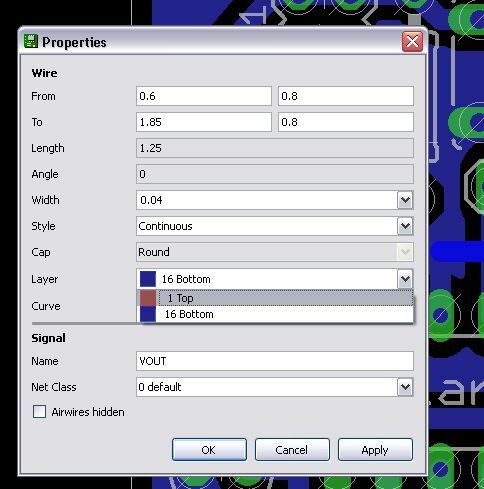 You can increase the size of the vias to something more normal like 0.039" or 0.031" diameter holes by right clicking each via, and choosing Properties from the contextual menu. Then select the appropriate drill diameter from the Drill pull down menu for each. Select the via's drill size from the pull down menu. Here are a couple more examples of my use of jumper wires on boards I've designed. Vertical jumper between V+ input and 555 timer IC's Vcc pin. Thanks for the great post, I was trying various discussion boards, but this post was clear on how to have jumpers on single sided boards. Glad I could be of help, Sunish! Thanks for the tip! 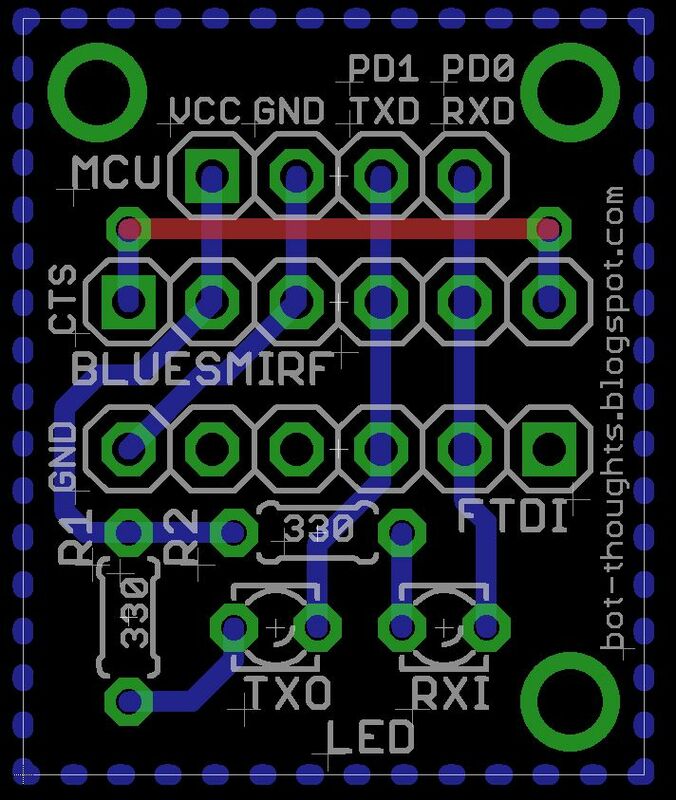 But is there a way to add jumpers as 0Ohm smd resistors on the bottom layer without ajusting circuit schematics? 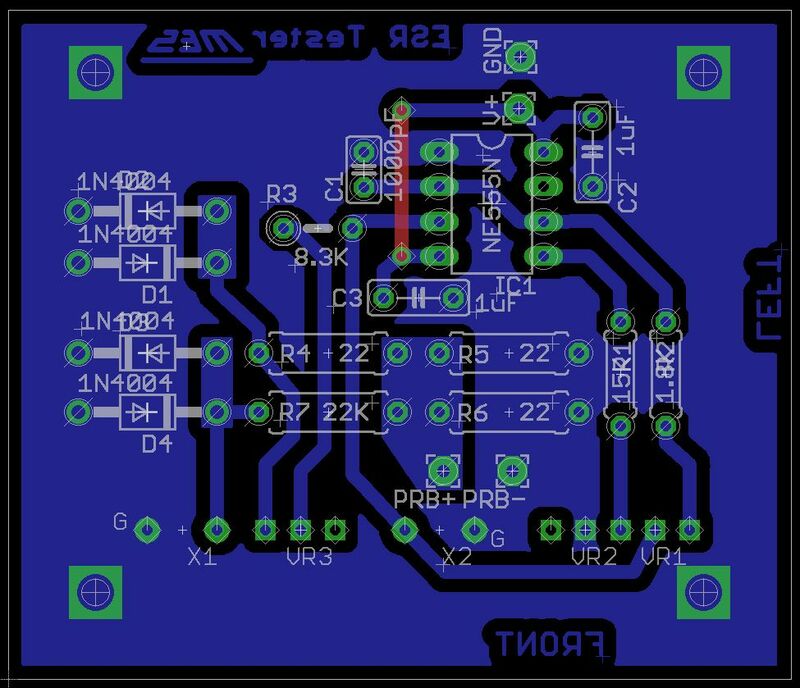 In Eagle, if you add a standard resistor then it'd have to be in the schematic or the board/schematic would get out of sync. 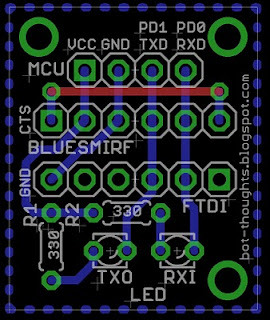 On the other hand, you could experiment with a custom component that has no schematic symbol and only has SMD pads and just lay it where you want it. 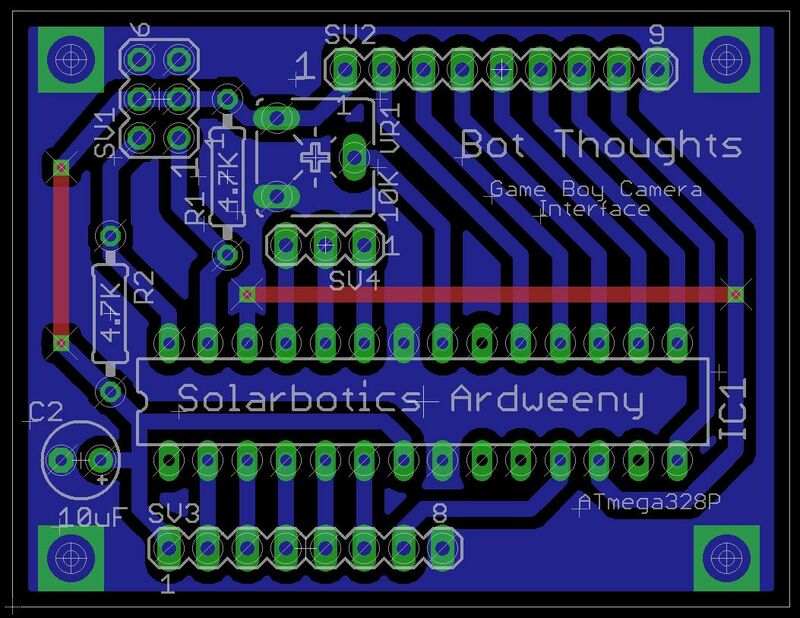 I discovered my "Bot Thoughts" logo can be placed directly on the board and not in the schematic. The logo is on the tDocu layer. So if you do your own boards, you could do 'pads' on some innocuous layer like tDocu and then when you do the toner transfer, print the regular bottom (or top) layer + the layer with the 'jumper pads' and then the resulting print out will have both. It's kind of kludgey though. Don't know of any other way but if I find one I will post it. Thanks for this nice tip. I made my own routs before I read this post, this means I added a pad and a stripe to the pad, but the thin rout line was still there,. This way is much more nice, and You get rid of those last thin routlines as well, and the board will probably pass the "erc" check. I have created a couple of two layer boards at home and I will continue to do so. You can by small metal things that you can push through a drilled via hole and then soldered at both sides, it works great. The only downside is that the pad area needs to be quite large(It may very well be possible to use a much smaller but thus far I have kept to the safe side). Been scratching my head how to do top links. But your method is so easy. Thank you.